We only see what we’re prepared to see, and what we expect to experience influences what we do experience. This has enormous implications on church, preaching, atmosphere in a service, etc. 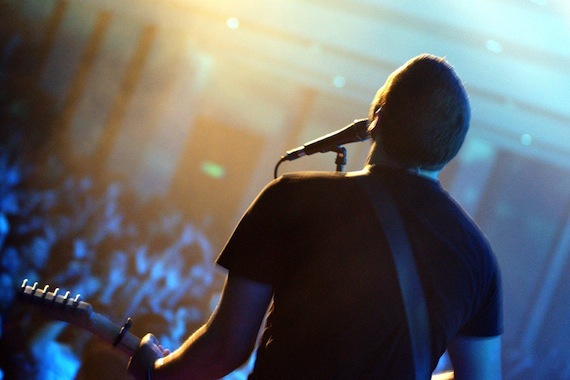 Often, when a worship leader or pastor get on a stage, they expect everyone wants to be there. That everyone has prepared themselves to be there or agrees with everything that is about to happen. Think for a minute about how different a church service is from anything else you experience in life. Where else do you stand with a bunch of people you don’t know and sing songs (that you often don’t know)? Where else do you sit and listen to someone talk for 30-60 minutes? Don’t even get me started on the churches that have the “turn around and say hi to someone” moment. You must as a pastor, help people be prepared for what is coming. You cannot assume they are there or ready for what is about to come. Have great signs. Atmosphere and worship start out in the road as people drive up and walk up to your building. Have great signs. They should explain where to enter, the front door, bathrooms, kids space, worship space and food. Your signs should be so good a guest should be able to navigate your church without ever having to ask for help if they want to. Assure them they don’t have to do anything. Give them an out. More than likely, they’ll take it anyway. But, by giving them an out you also communicate you know how they feel and that it is okay. Pastors, remember this: the New Testament is largely written to churches, filled with Christians. Don’t make those who don’t believe feel guilty if they don’t apply a passage. Yes, you want them to and tell them that. Also say, “You don’t have to do this, but if you do, here’s what you can expect _______.” Cast a vision for how amazing applying the truth of Scripture to your life. Talk as if they have no idea what you are talking about. This is what The Heath Brothers in their book Made to Stick: Why Some Ideas Survive and Others Die call the “curse of knowledge.” Christians and pastors forget what it is like to not understand the Bible. To not know the order of books of the Bible, what the sovereignty of God means, what justification or sanctification mean. Don’t assume everyone knows what you are talking about. If you use a big word (like the ones in the previous line), define them. It takes 10 seconds and if you don’t, you will give everyone who doesn’t know what you are talking about a great excuse to check out. Every pastor when they write a sermon and preach it want people to remember it. Most people though forget most of what is said in a sermon. This is why it is important to have one point instead of five. You can use visuals, video clips, readings, stories and a host of other things to make your sermon and church memorable. One thing that we do at Revolution that helps to make church memorable is to line up the songs with the sermon. This seems like second nature to us, but I am amazed at how many worship leaders and preachers are not on the same page. I can’t tell you how many times I’ve been in a worship service and the worship leader introduces a song by giving a 2 minute sermon that has nothing to do with the sermon and the point of the day. A lot of times people will debate if preaching is the reason the church gathers on a Sunday or is it worship. I would say it’s both. If you don’t have both, you’ve failed to do something very important as the gathered church. At Revolution, we use worship music to set up the sermon and then for the sermon to set up the response time and communion. Decide to connect the dots for people. People come to church with their brains all over the place. They often rushed to get out the door, had a fight on the way to church, a screaming child. They are tired and stressed from the week. They fall into the chair at church exhausted and wanting to catch their breath. They need help connecting the dots. Talk about how songs connect to a sermon. In recent weeks at the end of my sermon I’ve talked about why we are doing a song that we are doing. You don’t always have to do this. But decide that you will do the work of working with your pastor or worship leader to connect the dots for your people. Plan ahead. If you want to do anything great or creative or connecting the music with the sermon, you have to plan ahead. You can’t decide on Wednesday what you will preach on this Sunday. Does the Holy Spirit change things? Yes. Two weeks ago I rewrote my sermon at 11pm on Saturday night. That isn’t a pattern for me. We plan about 15 months in advance to that the person leading worship can spend time in the passage and let the verses speak to them as they prepare a set list. Have a worship leader that cares deeply about theology. Thankfully this is becoming more and more important. In the past, being a worship leader meant you could play guitar and sing. The bar has been raised in churches, which is a good thing. Your worship leader does not have to have an M.Div. in theology, but they need to know theology, care about doctrine and be able to discern if worship songs are doctrinally correct. Some of the most popular worship songs today are theologically incorrect. And never miss this pastor: your church will often learn more about God from the songs they sing than from listening to your sermon. Listen to the worship set while you prep your sermon. After talking through my sermon with Paul or the worship leader on Monday morning, when I get the final list, I will make a playlist for my iPod and listen to it in the car, while I am prepping my sermon or taking a run. I want the words to get into my head and my heart. This helps me connect the verses I’m preaching on to the songs we are singing, which helps to make church more memorable to someone when they leave the service. Listen and come ready to sing loud on Sunday! Here’s a new song we’re learning Sunday at Revolution Church as we look at John 14:7 – 31 and the peace that the Holy Spirit brings to our lives. Fits perfectly.